Everyone has heard the saying, “It’s not what you know, it’s who you know” regarding finding a job. The truth of the matter is that it is both, and what is even more important is getting that information into the right hands. All the ‘what you know’ (education and employment history) and ‘who you know’ (references) will do you very little good if your resume is so understated that it never gets passed up the food chain. The best way to advance your career and avoid missing out on perfect career opportunities is to take the time to make your resume so perfect that the words practically jump off the page. The following ten resume writing softwares are some of the most trusted on the market for helping you do just that. While you only really need one of these, take the time to look them all over to see which one feels the best for your situation. They are listed in order of their Alexa traffic count rating. Resume-Now boasts that you can put together your resume in just 20 minutes or less by just filling in the blanks. They have 14 different design templates to choose from so you can select the look that you think best fits the impression you want to make. Don’t worry though, during the process they will recommend one for you! The site also has tips and sample text that has been written by their experts and are career specific. All the formatting is easy to use. Users can try it for free and there is support available 7 days a week via phone, email and live chat. When you begin you will have the option to create a new resume or use a resume you have saved on your computer. It is very easy to use. You can even do a cover letter! My Perfect Resume is a quick way to put together a resume with numerous job-winning designed and expert-written examples. In about 10 minutes, you can have a flawless, professional resume. You begin by selecting the style you desire from various options: traditional, traditional 2, creative, creative 2, professor, pacific, conservative, designer, bold, bold 2, executive, executive 2, executive 3, alternative 1 and alternative 2. Next, you select whether you want to start a new resume from scratch or upload one from your computer. When doing one from scratch, you are led through various questions so that relevant writing examples can be loaded. It is very easy to use and there is a live chat support option available 7 days a week should you run into any difficulties. Although this software is not as easy to follow as the previous two on this list, it does have the advantage of being more flexible in the organization of the resume. For example, you can change the order of the sections and put education before or after experience. This allows you to put what you are strongest in first, such as putting education first if a recent graduate with very little work history or putting work history first if you have little or no education. The site is full of resume tips and examples, including things such as how to use action verbs in your examples to give more importance and effectiveness to your abilities. They also have a contact info video that is worth watching. It will definitely take more time to do a resume with this site, but it just might end up being better in the long run. The site also includes the ability to save your resume to be able to edit it later, a link for free business cards and a free job search feature. Pongo has been supporting job seekers for over 10 years. They created the first online resume builder and cover letter builder and have over 4.6 million members who have created over 6 million resumes. According to their member survey, 70% obtained jobs after using Pongo. Besides a resume builder and letter builder, they also offer interview tips, an activity tracker and a job search. They offer both membership plans and professional services. There are two types of memberships – one is free and includes the easy resume builder, tips and sample phrases, prewritten letter templates, job search and help from certified professional resume writers. The fee-based membership is available with a monthly or annual membership fee. There are numerous benefits included with the fee-based, which are all listed on their website. They also offer their services to completely write your resume for you. The fee for this depends on the level of employment you are seeking – entry level, experienced or executive. This company is a good choice for those looking for the stability of a business that has been around a long time and has a history of success. The Resume Companion is a resume builder that does the writing for you. They offer a free version as well as a pro version. The pro version starts out with a 14 day trial membership for just $4.95 that renews at $34.95/month on the 15th day unless cancelled. The Pro version includes the ability to save your resume to text, Microsoft Word and PDF, send it via fax, email or print, includes full access to cover letter builder, thank you letter builder and job application tracker. It also includes a complimentary resume review. Resume Companion began in 2009 and has assisted over 650,000 job seekers. The regular version can be used without any fees or even any registration requirements. If you are in a rush to submit a resume, this just might be a great option for you. For those looking for a more complete career building package, this one is worth a look. My Optimal Career is about making the optimal first impression so it goes beyond standout resumes and cover letters – it also gets into interview skills. They have won a number of awards and have helped more than 2 million people. They are currently offering bonus career tools for new members – a video resume, portfolio and website builder. Membership can be purchased for 1 month for $19.99 or longer periods (3, 5 or 12 month) which are offered at a discounted rate. The best value is their 12-month access which costs just $10/month. The site also includes a number of resume samples, cover letter samples, website samples, admissions interview questions and job interview questions. The videos about interview questions, including behavioral interview, final interview and handling inappropriate questions are quite enlightening and can be watched without a membership. The Resume Builder is a simple to use resume writing site that lets you try before you buy. You can create a resume and try out their tools and your resume is saved until you decide to activate your account. You do have to register to create your resume. If you just need a short term solution, you can purchase the 5-day access for $4.95 which lets you print, email or download your resume for 5 days. On the sixth day the account will convert to a monthly plan at $14.95/month unless you cancel it during the 5 days. They also offer a long term solution – their yearly plan for $99 which lets you create as many resumes as you wish. Since this works out to just $8.25/month it can be a perfect solution for those anticipating a longer period of time to locate employment. The site also includes a job search function and is in the process of starting a blog section. This site offers a download demo of their resume builder. One of the unique things about this resume builder is that they have a mind-boggling number of resume templates to choose from – more than 25,000! The site also is jammed with helpful resume writing tips as well as information about unique topics such as writing your resume for electronic searches, posting your resume on the Internet and various career tests for personal and professional development. The site also includes a quick tour of the software. It is easy to get help from them with a live chat option and a forum. 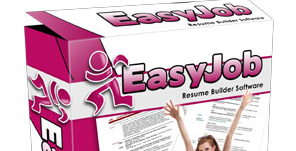 Over 100,000 users have created their resumes and cover letters with EasyJob Resume Builder. A nice surprise is when you click on the “Buy Now” tab which is currently showing as 40% discount it takes you to a screen with a code to use to get the software for FREE! Keep in mind that this was offered when this review was written, but hopefully this is the case later on as well. 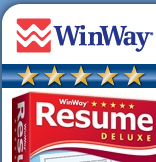 WinWay Resume Deluxe is currently on Version 14 being offered as a download for $29.95 or as a download and disc for $39.95 plus s/h. If you have purchased a previous version, you can order the upgrade at $19.95/$29.95 respectively. They offer a 90-day money back guarantee. It also includes the iPhone app ResumeShare. Some of the features of this software include resume creation using 14,000+ resume examples and 116,000+ job-specific phrases, assistance with determining the right salary to ask for based on your profession and experience, their patented ResumeAuditor to catch common errors and a video of a simulated salary negotiation. There is also interview assistance and a powerful contact manager so you can keep track of potential employers, networking contacts and references. Tons more features also! Obviously the ResumeMaker family of resume and career software website doesn’t get the traffic of the previous nine sites, but that is likely because the software is more often purchased at office supply stores and other retailers. It is, in fact, the leading brand of resume software on the market. They offer three different options: Professional Version 18 ($29.99), Ultimate Version 6 ($39.99) and Web (monthly of either $1.49 or $2.49 depending on level). Prices shown are through a link to Individual Software. You may find the software at different prices at retailers. Ultimate has the addition of a Career Planning Guide. The Web version does not include the guide and also does not include job search/contact manager, but it does allow users to create and edit resumes online which the other two versions do not. They also offer a mobile device app called ResumeMaker On-the-Go. Besides the resume components the software also includes interview preparation and salary negation through its virtual interview feature including the ability to practice 500 interview questions and answers. You can learn the responses hiring managers expect to hear and also know strategic questions you can ask during the interview. The powerful job search tools included are incredible including their ResumeCaster which instantly distributes your resume to the top 90 career sites. Use the contact manager to organize your job search. As you can see these 10 resume writing software options are quite different from one another both in costs and features. For some people a quick and simple resume is all that is needed and the online, free options will work quite nicely. Others need the additional career assistance that is part of some of the other software offered. Whatever your need is, one of these ten should be perfect for getting this task accomplished and getting you on your way to your dream job!